Price is per bead - measures a long 59mm x 28mm x 7mm, top-drilled, making it ideal as a pendant or focal bead. Every one of these will look slightly different. Fossil beads are the latest trend in jewellery making. These stones are especially cut to reveal unusual and interesting surface features, and then dyed brilliant colours making dramatic eye-catching jewellery. Rich burnt red and vivid polished purple are particularly spectacular. These beads are created from stones containing fossils of creatures that lived millions of years ago. The fossilized rock is then pulverized and formed into the bead shape, ready for polishing, drilling, and making into jewellery. Fossil coral is the fossilized remnants of ancient coral reefs. 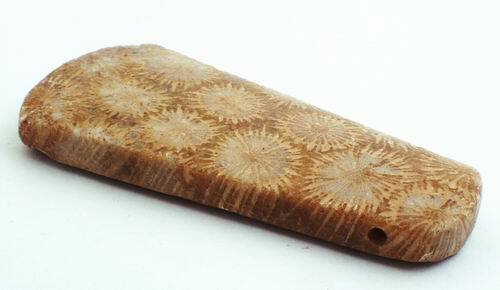 Their striking pattern is determined by the species of coral that became fossilized. A common fossil coral is made from crinoids stems. These look like flowers, but were really tiny animals – the lines radiating out to form circles are where their spines were attached.